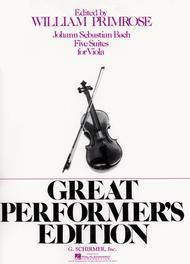 5 Suites (Viola Solo). Composed by Johann Sebastian Bach (1685-1750). Edited by William Primrose. For Viola. String Solo. Great Performer's Edition. For unaccompanied viola.. 44 pages. G. Schirmer #ED3142. Published by G. Schirmer (HL.50334250).The first five of Bach's six cello suites (BWV 1007-1011), arranged for viola.